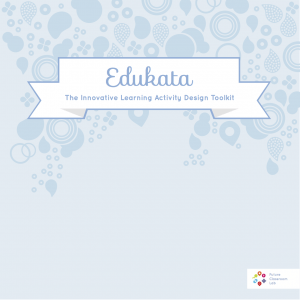 In the LeGroup research group we are happy to announce Edukata, the innovative learning activity design toolkit (PDF). Edukata is a tool kit for educators. It helps them to implement collaborative design process to create innovative classroom practices. It is based on empirically tested methodology piloted in over 17 European countries in over 2000 classrooms. In the pilots Edukata was found to positively impact teaching, learning and attainment and to foster 21st century skills. From many point of views Edukata presents very Finnish approach and a way of thinking about education. I did a search to this blog to check what I have wrote earlier about Finnish educational system, PISA etc. I found some interesting posts. Reading them now makes me think that Edukata just makes so much sense. In 2005 I wrote how high standards in education means less low-level standards. In the article I tell — lately many times told story — how Finnish kids take no standardized tests except the final exams in the end of the high school. I also tell how in Finland we trust our teachers and their ability to create a great school and learning environment. Great teachers are not only teaching — they are creating learning opportunities for their students. In 2007 I wrote, whatever how much we love technology, in education it is a means to an end, not the end itself. I pointed out how the most important things to take care of are (1) teachers, (2) pupils, and (3) the system as a whole. Importance of the wellbeing of teachers and pupils is pretty obvious. About the system I wrote: “… system is doing well when it is supporting continuous pedagogical and organizations development, open for criticism, willing to look for solutions to the challenges recognized …”. In 2009 I again wrote, this time related to the 21st Century Skills, how important it is that we see the teaches as the key players in the system developing their own practices. At that point, however, I also pointed out that in Finland we should also wakeup and start to use ICT in education. Although I also made a point that in ICT in schools we should focus on social software, open content and free and open source software (today I would add in here programming and hacking). The main people behind Edukata have been Tarmo Toikkanen and Anna Keune. It is a privilege to work with people like them; smart and analytical (design) researchers. Thank you. Posted in Collaboration, Design, educational tool.